Last year we discovered Viburnum leaf beetle (VLB) here at the Chicago Botanic Garden for the very first time. As I said then, “I strongly suggest you begin monitoring your viburnums for this critter” as once they move in, they become a perennial pest, just like Japanese beetles. In early March, we monitored many of the Garden’s viburnums for signs of VLB egg laying and focused on areas where we observed VLB activity last summer. I had read recommendations for pruning out these twigs (with eggs) in the winter as a management technique and wanted to give it a go. To assist with this project, I called in our Plant Health Care Volunteer Monitoring Team; the more eyes the better. The six of us (all armed with hand pruners, sample bags, and motivation) began a close inspection with a focus on last season’s new twig growth for the signs of the distinctive straight line egg-laying sites. In less than five minutes, we found our first infested twig, pruned it out, and put it in a sample bag. After about three hours, we had collected about 20 twigs with eggs. Truly, I was expecting to find a lot more. This was somewhat disappointing, as I had created a challenge to see which volunteer would fill his or her sample bag and collect the most. This turned out to be more like a needle in a haystack search, as it was a lot more difficult than I had thought. I also feel that the egg-laying sites would have been easier to see if we had done this in early winter, as the egg-laying locations had darkened with time. Back at our lab, I dissected some of our samples under the microscope. When I removed the cover cap (created by the female after egg laying) material of a few of the egg-laying locations, I found about six orange, gelatinous balls (the overwintering eggs). These eggs were about a month or two from hatching. For background on this new, exotic insect pest, please see my June 5, 2015, blog on the Viburnum leaf beetle. In early summer, you would look for the distinctive larva and signs of leaf damage from the larva feeding. 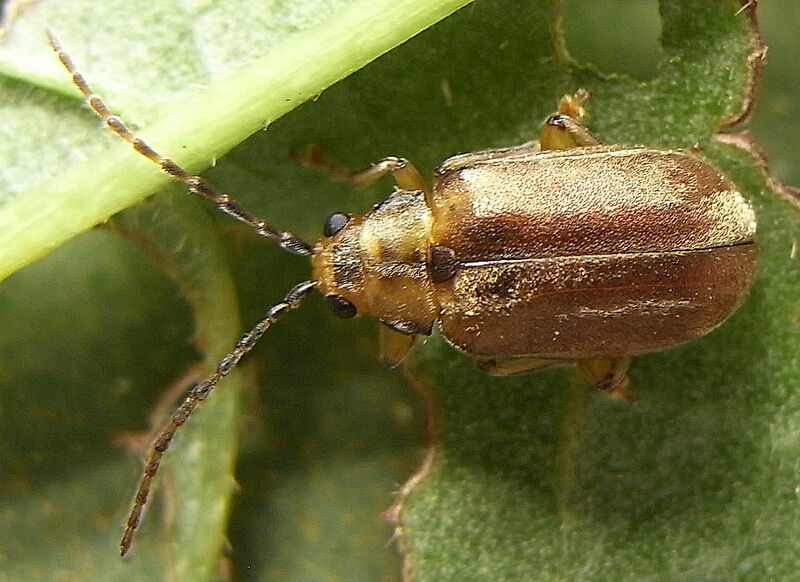 In mid- to late summer, you would look for the adult beetle and leaf damage from the beetle feeding. 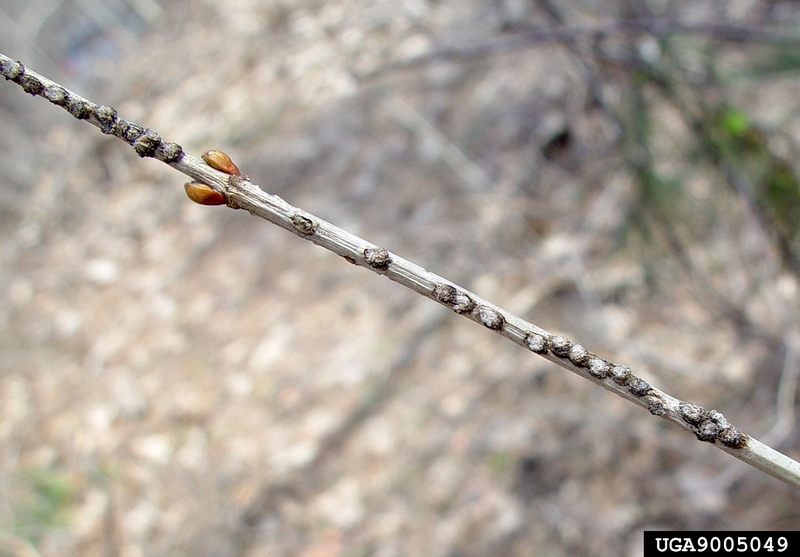 In the winter, you would look for signs of overwintering egg-laying sites on small twigs. 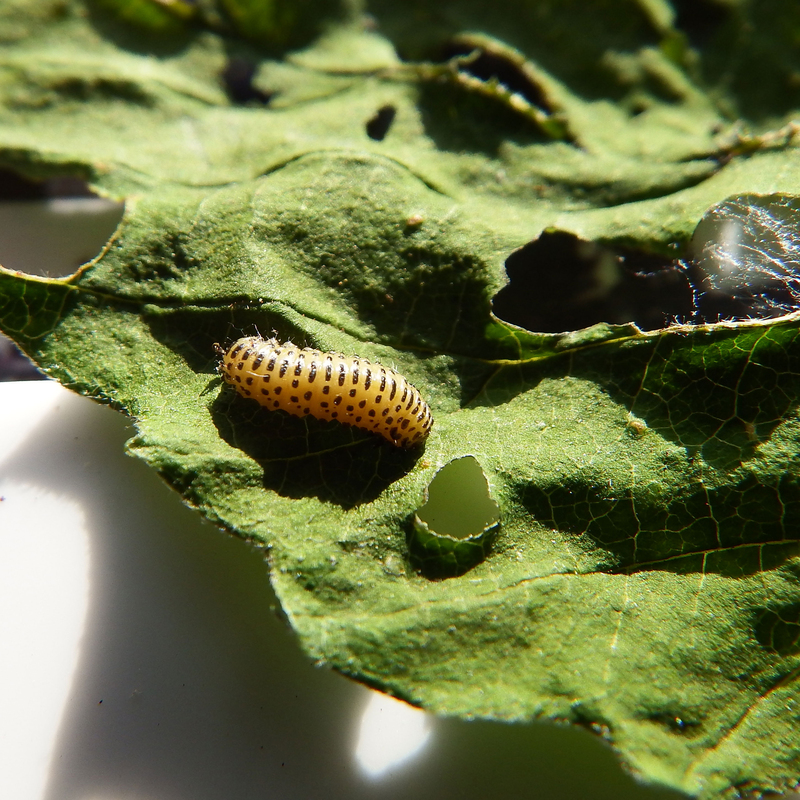 In early May, eggs hatch and larva feed on viburnum leaves. In mid-June, the larva migrate to the ground and pupate in the soil. In early July, the adult beetles emerge and begin to feed on viburnum leaves again, and mate. In late summer, the adult female beetle lays eggs on current season twig growth in a visually distinctive straight line. Hopefully our efforts will lessen the VLB numbers for this coming season. We will see when we monitor the shrubs for leaf damage and larva activity in late May. If nothing else, it was a great learning experience with this very new, exotic insect. Special thanks to the Plant Health Care Volunteer Monitoring Team: Beth, Fred, Tom (x3), and Chris. Viburnum leaf beetle is here, and he’s not a good neighbor! Yesterday was an exciting (yet worrisome) day for me here at the Garden. We found viburnum leaf beetle here for the first time ever—although his arrival was not unexpected. Two separate discoveries were reported to me within just a couple of hours. One of our horticulturists made a discovery in one location, and one of our trained plant healthcare volunteer scouts found the beetle in another location. Both finds were on arrowwood viburnum (Viburnum dentatum), the beetle’s preferred host (and high on our watch list). 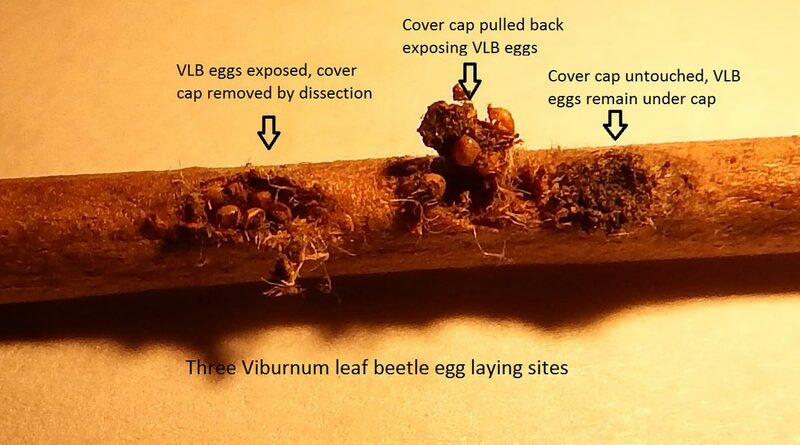 Click here to download the viburnum leaf beetle fact sheet with tips on managing the beetle. If you live in the area, I suggest you monitor your viburnums for our new foreign friend. The sad thing about this critter is that once he moves in, he will become a perennial pest, just like Japanese beetles. In ornamental horticulture (your home landscape plants), the viburnum leaf beetle seems to be on the verge of having a great impact in our area, as nearly everyone’s home landscape has viburnum. I’d like to take a moment to review this new critter. The viburnum leaf beetle (VLB) is native to Europe and was first found in the United States (in Maine) in 1994. It was first found in Illinois (Cook County) in 2009. In 2012 and 2013, the number of reports increased from Cook County and also from DuPage County. In late summer 2014, there were numerous reports from Cook County and some specifically from neighboring Winnetka, where complete defoliation was reported—only five miles from the Garden! 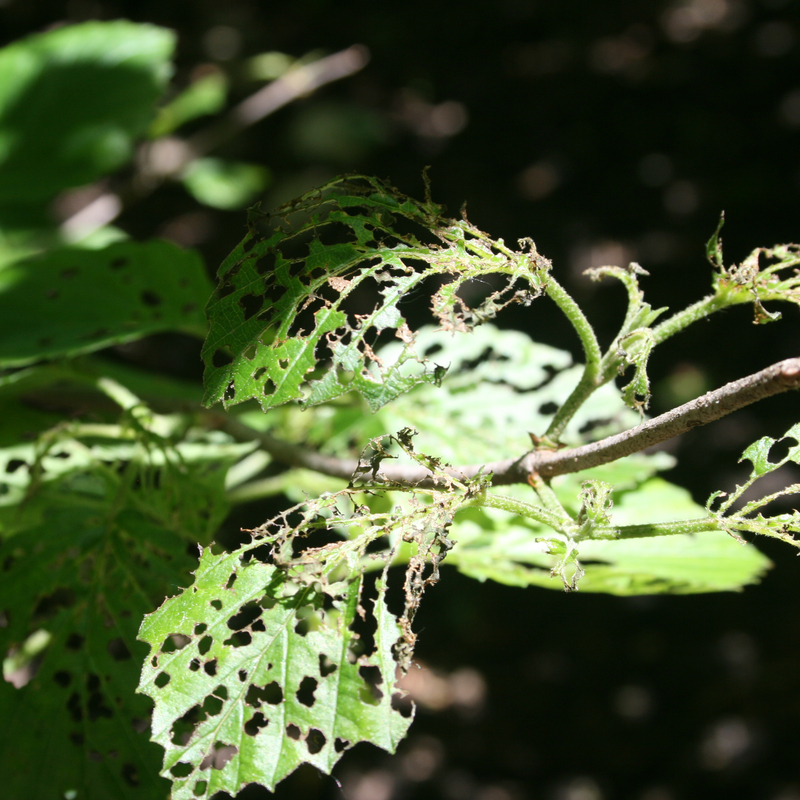 Leaf damage to Viburnum dentatum at the Chicago Botanic Garden by viburnum leaf beetle larvae. The VLB larva and adult both feed on foliage and can cause defoliation, and several years of defoliation can kill a viburnum. If you live in the area, I strongly suggest you begin monitoring your viburnums for this critter. There are many great university-created fact sheets for VLB that can be found online, or contact the Garden’s Plant Information Service for additional information. Please report new finds to the Illinois Natural History Survey, Illinois Department of Agriculture, or University of Illinois Extension Service. Many people ask us: is it true that some viburnums will not be affected by the viburnum leaf beetle? Viburnum leaf beetles prefer viburnums with little to no hair on the foliage. Plants grown in the shade also exhibit more feeding damage. The University of Illinois Extension has placed viburnums into four feeding categories: highly susceptible, susceptible, moderately susceptible, and most resistant. Viburnum species such as arrowwood (V. dentatum), European and American cranberrybush viburnum (V. opulus, formerly V. trilobum), wayfaringtree viburnum (V. lantana), and Sargent viburnum (V. sargentii) are in the highly susceptible and susceptible categories and can easily be destroyed by repeated infestations of the viburnum leaf beetle. Moderately susceptible species such as burkwood viburnum (V. burkwoodii), blackhaw viburnum (V. prunifolium), and nannyberry viburnum (V. lentago) may exhibit varying amounts of susceptibility, but are usually not killed, depending on the species. Other viburnums, such as Koreanspice viburnum (V. carlesii), Judd viburnum (V. x juddii), and doublefile viburnum (V. plicatum), are resistant to viburnum leaf beetle, will show little or no feeding damage, and are capable of surviving slight infestations. Please contact Plant Information Service at (847) 835-0972 or plantinfo@chicagobotanic.org for susceptibility questions on specific species. If you are a plant and bug person like me, please consider becoming a NPDN First Detector and help be on the lookout for these exotic invasive plant pests and pathogens. The NPDN offers an online training course to become a First Detector at firstdetector.org. It’s free, and upon completion, you even get a printable certificate! First, plants may show signs of cumulative stress from the inconsistent and extreme weather patterns of the past few years: the 2012 drought, followed by the cold winter of 2013-14, and greatly fluctuating seasonal temperatures. These stress factors have an accumulative negative effect on plant health. When plants are under stress, their defense mechanisms are down, and they are much more prone to disease and insect attack, just as people who don’t eat properly and don’t get enough sleep are much more prone to illness. So what can we do? Primarily, just a bit more TLC in the way of cultural care: watering, mulching, pruning, fertilizing, monitoring and managing pests, protecting, and focusing on the more delicate plants in your landscape. Second, new high-consequence invasive pests will become of concern. We now live with Japanese beetles, which are here to stay; we have experienced the Asian longhorned beetle (which was supposedly eradicated in our area, but I doubt that’s the case); and we are right in the middle of managing the emerald ash borer crisis. So what’s next? Sad to say, there are many other invasive pests to be on the watch for. Two that are literally knocking at our door now are the brown marmorated stink bug (primarily an agricultural concern) and the viburnum leaf beetle (primarily an ornamental landscape concern). Find more information on identifying and dealing with emerald ash borer on our website, and in our previous posts on EAB. In ornamental horticulture (your home landscape plants), I feel the viburnum leaf beetle is on the verge of having a great impact in our area, as nearly everyone’s home landscape has viburnum; I’d like to take a moment to review this new critter. The viburnum leaf beetle (VLB) is native to Europe and was first found in the United States in 1994 in Maine. In 2009, it was first found in Illinois (Cook County). In 2012 and 2013, the number of reports increased from Cook County and also from a new county, DuPage, as well. In late summer 2014, there were numerous reports from Cook County and some specifically from our neighbor Winnetka, where complete defoliation was reported—only five miles from the Garden! The VLB larva and adult both feed on foliage and can cause defoliation, and several years of defoliation can kill a viburnum. We have not yet found VLB at the Garden but have been monitoring our viburnums closely. If you live in the area, I strongly suggest you begin monitoring your viburnums for this critter. There are many great university-created fact sheets for VLB that can be found online, or contact the Garden’s Plant Information Service for additional information. Please report new finds to the Illinois Natural History Survey, Illinois Department of Agriculture, or University of Illinois Extension Service.